From a chance acquisition of a battered leather-bound notebook, an extensive and extremely well-written narrative was revealed which recounted the life of a midshipman in the East India Company, through to the time when he owned his own vessels and settled in Tasmania. 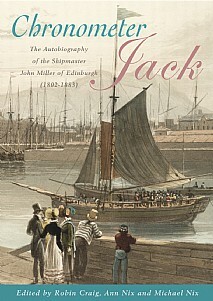 Chronometer Jack is an outstanding autobiography by John Miller, an Edinburgh-born Shipmaster and Coastguard officer, an educated man whose working life commenced on board East India Company ships. It provides many insights into the tough but sometimes amusing life under William Younghusband on the Lord Castlereagh, the tyrannical Tommy Larkins on the Marquis Camden and Thomas Balderston on the Asia. Seconded to an opium vessel and the associated risks of trading in opium in the 1820s, Miller experienced the trauma of capture by the Chinese. Returning to Scotland, he married Jessie Adamson, the sister of John and Robert, famed pioneers of photography. Later, Miller set up in business as a master-shipowner in the convict colony of Tasmania, trading mainly with Sydney and Port Phillip. The gripping narrative is full of incident and unforgettable characters and his first-hand observations on society in Van Diemen's Land when still a convict colony make compelling reading. Bankrupted, Miller and his family were forced to return to Britain where circumstances forced him to join the Coastguard, serving in Northumberland, Tynemouth and Lincolnshire. His frustrations and bureaucracy, the higher status accorded former Royal Navy Officers and, in his recruiting capacity, the relatively poor quality of seamen joining the Royal Naval Reserve, constantly surface in the text - a rare insight into the occupation and tribulations experienced by a Coastguard officer in the 1850s and '60s. Although Captain Miller's original manuscript included numerous references to people identified only by an initial letter, most of these were subsequently identified, providing his narrative with a rich and well-attested circumstantial context. A book that will appeal greatly to anyone who enjoys naval and maritime history, modern history and autobiographies. It will also be of interest to ships and shipping enthusiasts and anyone looking for an engrossing and entertaining read.